Finally, after several months, the sequel to the extremely successful platformer Wally has been publicly released, in which you control a zany, bouncy, cheery little creature named Wally (surprise!) that has to use obstacles and avoid hazards and falls to collect the proper keys and make his way to the exit, collecting balloons and bonus lives along the way. Land of the Wallows uses an updated version of the physics engine from the previous game, which is as smooth and fluid as one could look for. Wally has variable jumping, clean interaction with all the objects, logical controls, and slippery floors, among other things. He gets to roll giant balls, ride balloons, surf fountains, and flip switches to make his way to the exit, while the player enjoys neat features such as a level editor and the ability to load new skins for Wally. The engine is not completely bug free, however, though the bugs are small and uncommon. For some reason, walking into a spring from the left or right results in it looping its animation stupidly while Wally stands there, staring obliviously into the distance. Respawning during a level sometimes causes some major loss of fps for a couple seconds. Occasionally a ball will not stop its rolling animation after you're gone. These bugs have very little effect on gameplay, however, and the pros overwhelmingly outweigh the cons. Screenshots are unable to do this game justice. The graphics, when viewed still, may appear to be bland to some, with minimal color change and fancy effects. In motion, the graphics have stunning animation, brilliant particle effects, and fit together seamlessly. Once you try making a skin for him, you'll notice that Wally has a complex set of animations for various actions, like other interactive elements of this game, and the terrain all melds together through extensive tilesets. Bright colors keep the game always interesting to look at, and overall the graphics work together to create a fabulous playing environment with a unique style. Like any platform game where the same few actions are repeated often, sound is bound to get annoying. Keeping that in mind, it took surprisingly long (more than one time beating it) before the 'yippee!' 'woohoo!' '[disgruntled splat]' sounds got on my nerves. They are used well and only when needed to add to the playing environment much more than they end up taking away. Music is used as might expect in a platform game, and serves that position well, although not original. There are several songs to keep you occupied such that the music won't get annoying unless you find it annoying from the start. When you get bored of the default set of sound effects, you can download a profanity patch off the author's website that, among other things, replaces the sounds with more of a South Park audio idea. Wally has extremely high replay value for what appears at first to be a small platform game. 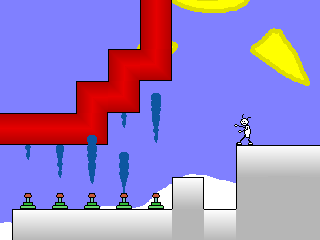 It has more than 40 levels in the actual story part, a set of user-made levels, and a level editor to make your own for showing off at the game's website. Also, you can make and load your own skins, adding a fresh appearance to the character, and punch in some crazy cheats once you've beaten it. Even without this bonus stuff, Wally would be a game to keep, and as it is I just can't stop playing. Highs: Smooth, animated, interactive, immersive playing environment with lofty replay value. Lows: Some small bugs show themselves occasionally, sound's novelty wears off. Recommendations: The 28 people who like Wally: Land of the Wallows also like the following games. What a thoroughly excellent game. The graphics are beutiful and blend together seamlessly. Wally (and everything else) was animated well, and the minimal shading just made it look nicer. Wally's movement is more precise than most people seem to be saying, though the whole skidding-right-off-a-ledge thing does happen sometimes. Otherwise, the clean gameplay is not annoying and indeed, the levels are pretty fun (though difficult later on). The music is good, the sounds not really annoying at all. This game is FULL of polish, more so than many other games I've played (but not all). I noticed only the bugs that the reviewer noticed, and it had enough levels to keep me occupied for a long while (actually, I still haven't gotten too far). Pretty good concept and storyline, though it could have been better. I think i like it the way it is. Also, the before-level screens are often hilarious. This is one game that you won't want to miss. I highly advise you to play it! Right now! OMG Messhof is the first creator ever which I've seen using such simple sprites and still making such good graphics and gameplay! Very good graphics! And the game is addictive! I've been playing 3 hours without quitting, and I get bored of many games after 3 hours, so good job! This deserves a 10/10! This game is incredible... in almost every way. We're havng the same problom as pi_4 exepet it's not fixing! This is the best Game Maker game ever. It has great graphics, excellent gameplay, and excellent challenge and a learning curve. Some of the higher levels border on impossible. The whole game melds together seamlessly, one level to another. This is not just my favorite game maker games, but one of my favorite games. It's really a great game, but i found a bug. Pressing 'K' kills the character. But if the character is back at the start position, all objects are still at the place it was when the character died. So there's no use of it. Fix it. But overall, definately a 10! download works now. my site was shut down for a bit. Very good game. Lots of options, many levels, and the editor makes it all the better. Everyone has their own series to follow. For some johnny, for some, well i dont know, some popular series. But for me it is Wally. He (or she or it) never cease to amaze me. It is simply a wonderful game. I've beat both and i have to say i prefer the original. Even though it was incredibly easy i didnt like the puzzle like concept of the sequel. Though still incredibly amazing game. I would only like a better story for the second one and a question for the creator, Should i expect more wally any time soon? It seems like this game was released a bit too early, because this game needs a bit more work. Sound: Did anybody else recognize the music from the SNES game, 'Zombies Ate My Neighbors'? Or perhaps that the sound effects came from the PS1 game 'Lemmings'? Not that this is a big deal, considering the difficulty of producing your own sounds, but it would have been nice if the sounds came from a less recognizable source (or perhaps i'm one of the few people to play those games :-D). Those are good sounds, however, and were pretty good picks for a game like this. Graphics: The graphics were pretty simple, but pretty unique as well. I liked the look of the character himself, but the other items, such as the balloons and the balls, didn't really mix well with the look of the character. Nice job, though. Control: I will admit, I only played a few moments of this game, but for a good reason: the character seemed pretty unwieldy. How many of you died because you jumped way further than you intended to? And how many of you died because because you landed on spikes 20 feet away when you simply wanted to fall off of the edge? Maybe I'm just bad at controlling him, but the control of this game is obviously not as good as some of the better platformers out there. I could rate on gameplay, but I didn't play enough of this game to rate it so thouroughly. Because I only played a small portion of this game, i'm not gonna give it an official rating, only this comment. From what I played, however, i'll give it a 5/10. Collecting balloons got old for me :) Maybe i'll give this game a more thourough review in the future. I really just didn't find it that entertaining. I'll give it a six out of ten. I guess it deserves more, what with the level editor and all, but I personally didn't get much enjoyment out of it. This was a good game, except the fact that the background music is ripped from the Final Fantasy games, which is not a problem, except i don't see any credit given to them. This is a pretty decent game. Well made. Um... where's a download link? I can't download it. Sounds very cool, though! oh NOW it works! good.. no... GREAT game! Some of the sound was ripped from Lemmings But you used them in a good way! ok I have to admit that when I fist saw this game well...let's just putit I didn't think it was a very exiteing game but now... now I know I was wrong. this is a very fun game (and I don't like platformers often) the stoyline is a little ruf but funny. I like the sprite adding thing. Gameplay: 8/10--It was a tad annoying how he would go farther than you wanted but that added challange so I survived. It was also really smooth so that was good. Graphics: 9/10--great, simplistic, but well round. How could you say that, Sparlatacus? It's fun, full screen or no. And besides swearing, I think it's a great game! I rate it a 9.5/10. Hoho... You know what makes a good game? Originality. I don't care what the others say. This is a great game. When you make a great game, you have to expect people to criticize the sequel to it. My young sister (aged 9) found this game incredibly enjoyable so I guess she's living proof. By the way, this game was aimed at that age level... right? I give this game 10/10 for the reason above. Graphics are really nice. Good work! Wally was animated really well. Hmmmm...what can i say? WOW! Idea was intresting, I'd like it. I think this game is great. I'm a beginner, so if u can help me help me!!!!! This game is pretty good and all, it's just that it gets boring after a while. But, there are some good special effects that are pretty good, and don't forget the level editor. This game is not as good as it is hyped up to be. It is not full screen so that is a little annoying because if it were than it would be much better (I hate small graphics). I know you have the option to do it, but you have to fiddle with command line and such, it should have full screen as default. Otherwise I like it, but it feels a little strange this game. The main character is nothing more than a small white guy, and there are lots of new advanced stuff like how you have to collect flies to open computers and how you might end up collection lots of keys with different colors. I like this, but I don't get the same arcade feeling I got from the original. Sure this game has lots of more features, but the original Wally is much better. 6/10 + 1 because you can make your own levels, so it gets 7/10. A 9/10 rating would strike it as a masterpiece, something it is not. But a great game? Sure it is.